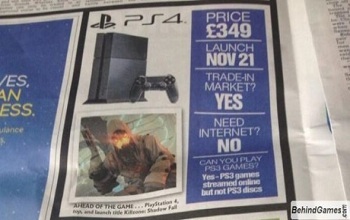 The British newspaper The Sun has released an advertisement with a supposed PS4 release date. The holiday season is going to be a busy time for gamers this year. In addition to a slew of new Wii U titles coming out in time for Christmas, the Xbox One and PS4 have both been confirmed for releases that will position them for yuletide product placement. That being the case, both Microsoft and Sony have been a bit stingy concerning the exact release dates for both consoles. While Microsoft has confirmed the Xbox One for a November release, Sony has only given a vague "holiday 2013" release window. That being the case, a recent newspaper ad has now pegged the PS4 with a release date. Appearing in The Sun, a popular newspaper in the UK, an ad for the PS4 has said the console will launch in the region on November 21st. The ad also states that the console will sell 349 pounds sterling, which matches the price point Sony had previously confirmed for the UK. While an advertisement in a newspaper is in no way an official confirmation, a November release would be an interesting move for Sony which has put considerable effort into countering the Xbox One on nearly every facet, from its price to the console's policy on used games. Releasing the PS4 in the same month could serve to further rob the Xbox One of any advantages it might have had if the PS4 had launched at a later date.